When my girls were babies, I loved sitting with them and playing. They learned something new every day, and I didn't want to miss a second of it. As they grew up, I scheduled play dates so they could discover the joys of playing with friends. However, I'm discovering that our kids sometimes need time alone. They learn seven key lessons when they play in their own little world. My girls get creative in the kitchen when they help me cook, and it's fun watching them come up with new games when they play together. However, their creativity really shines through when they play alone. They invent their own activities, rules, and even dialogues. I love watching them become more imaginative as they hone their creativity and ability to think outside the box, awesome skills they need in the real world. How many decisions do you make in a day? I've heard that the average is 5,000. That sounds exhausting! To help my girls become better decision makers, I encourage them to play alone. They decide what to play, where to play, and other details as they improve their personal decision-making skills. Anger, sadness, fear, and embarrassment are all common emotions that can be difficult for kids to process. I've found that it's sometimes helpful to give my girls time to play alone when they're struggling emotionally with something. In their rooms, they feel safe and can play at their own pace. 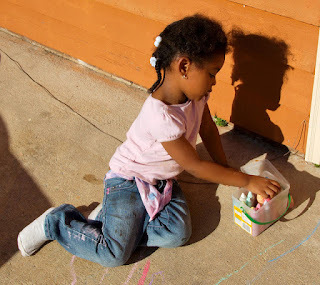 Solitary play gives them a chance to process emotions and deal with the feelings that challenge them. After a long week at work, I can't wait to sit down and put my feet up with no obligations. Kids need solitary play for the same reason. They don't have to compromise, talk to friends, or act a certain way when they play alone. It's a fun, relaxing, and wonderful time with no expectations. I was watching my girls play at the park with friends the other day, and they kept moving from one activity to the other. They were definitely having fun, but it made me appreciate the times they get to play alone. When they focus on one thing at a time, whether it's a book, drawing, or blocks, they can work on a project until they're ready to move on to the next activity. They'll use that ability to focus when they're at school, on the ball field, and at other times in real life. It's an honor for me to meet my daughters' needs, but ultimately, I want to work myself out of a job and raise independent girls who function on their own as adults. That's one reason why I encourage solitary play. My girls keep themselves occupied as they play what they want to and become more self-confident. In the end, solitary play is one way I equip my girls to operate in the world on their own. From the time they wake up until bedtime, my girls are on the run. Does that describe your children, too? If so, give them opportunities for solitary play. They need the free time as they take a break from the stress of their daily routines, face no demands, and have no one telling them what to do. I know my girls value this time alone, and your kids will, too! Our kids need to play with us and with their friends. Before you schedule your next game or play date, though, consider these seven benefits of solitary play. Give your kids the chance to be in their own little world. They'll be better for it!